The Austin Seven Clubs Association ( A7CA ) exists to promote the pre-war Austin Seven car through its umbrella of Austin Seven Clubs. The Association was formed in 1969, with the view of bringing together the various Austin 7 clubs that then existed. Now just about every Austin Seven club worldwide is a member or associate member. The Association produces a high quality quarterly magazine, in the style of the Austin Seven handbooks, which are available through the member clubs of the Association. These are now known as the ‘Grey Books’ amongst the Seven enthusiasts. The Association is run by a committee which is made up of members from the various clubs who meet on a quarterly basis. 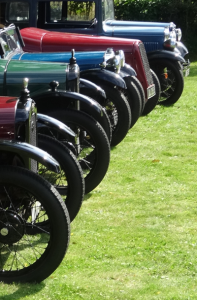 Austin Seven Clubs across the country and world run regular events, check each individual club website for event listings however highlighted events can be found on our Events Calendar. The Austin 7 movement is well supported by a range of Suppliers providing a excellent service to keep the vehicles on the road. The Association holds a Archive of Austin Seven literature and memorabilia from the Austin Motor Company. Some items are available online. We also maintain a register of Surviving Vehicles. An online search facility can be used to check individual vehicles.